To celebrate WD's NAStravaganza*, HEXUS is giving you the chance to revamp your network storage infrastructure! Over the course of the next month we'll be giving away NAS boxes along with optimised WD Red hard disks. We'll have a new weekly prize for the next five weeks, starting today with a QNAP HS-210. Designed as a silent NAS solution for home theatre enthusiasts, the HS-210 is completely fanless and we'll get you up and running from day one by including two 3TB WD Red disks! A fantastic bundle, so don't miss out, answer the following simple question to enter our free prize draw, and don't forget to check back next week for another unmissable WD giveaway. From January 19th until February 20th save money by taking advantage of some great NAS bundles. WD has partnered with leading NAS manufacturers and etailers to bring you their NAS Class drives WD Red and WD Red Pro. Safe, fast, accessible and affordable storage. The competition winner will be picked at random from all eligible entries that arrive by midnight of the closing date, February 6, 2015. The winners will be notified via email by February 23, 2015. The winner must claim their prize within 7 days of the promoter sending notification. If the prize is unclaimed after this time, HEXUS reserves the right to offer the unclaimed prize to a substitute winner selected in accordance with these rules. 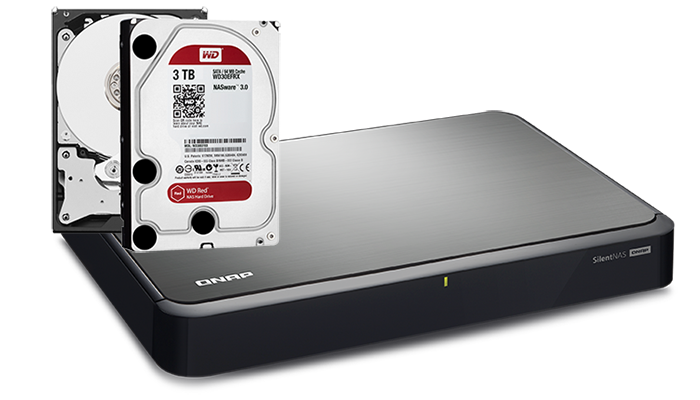 The prize is a Qnap HS-210 NAS and two 3TB WD Red hard disks. Great timing, will it be a different product each week? Yup, lots of goodies in-store. about to pull the trigger on a synology box…..I shall wait a while fingers crossed. Great prize. Many thanks to Hexus and WD.